"I went home and handed my wife the checkbook." "Did you ever get your checkbook back?" "Unfortunately, yes, I did. My wife has Alzheimer's. It's been a good 51 years, though." One pen for the men. One for the women. Then we'd bus them to the magistrate, and they'd generally be released on their own recognizance. But at that point, they'd be eighty miles away from their personal effects. I support their right to protest. That's their privilege. But I wasn't going to help them more than I had to. Over twelve hundred people went to jail that day. And that’s another story in itself, but anyway. The protesters estimated their crowd at fifteen thousand. At the time I swore up and down it wasn’t more than twelve, but I really believed them. I think there were fifteen thousand people. I've been in the trenches many times when these things went off, and I'd do it again in a heartbeat. But only on the upwind side. I don't hold with making anyone watch on the downwind side. Why'd it happen? The military side was making those decisions. We didn't have any say. MacArthur famously wanted to keep going into China and settle things once and for all. They didn't let him do that, but he did order a bunch of these cannons. This was only fired once. We'll get about three hundred feet from Ground Zero. Those pens you see held animals--mostly pigs, because they're a good human analog--at various distances, above ground and in trenches to find out what the effects would be. The buildings--you can see the steel and aluminum didn't do so well. We thought being dome-shaped might protect them. It didn't, but the earth berms did. Normal concrete wasn't so good either. The special, high-PSI concrete did pretty well. This train bridge was built just like a section of the Chicago "L". It was so badly twisted up, we had to take most of it down. I'm glad we kept a section. We weren't planning on tours then, but I always like to show people the bridge. One-inch I-beams, thirty-two inches wide, just bent like that. An enormous Mosler bank vault sits abandoned and forgotten on the dry lake bed of Frenchman Flat, Nev. It is ugly and rusting, a big cookie jar from hell -- yet it now exists as one of America's greatest monuments to clear thinking. 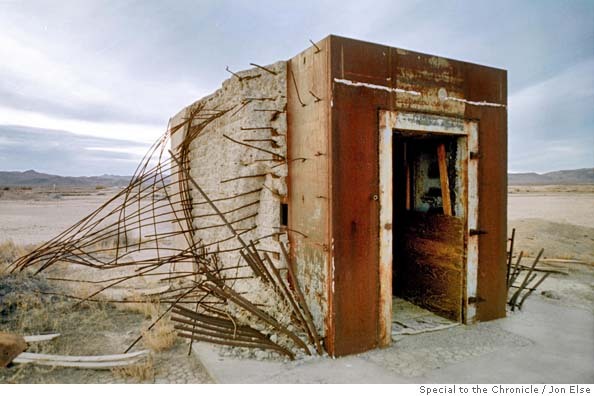 That giant safe is a relic of an Atomic Energy Commission experiment in 1957 ("Response of Protective Vaults to Blast Loading"). Filled with stocks and bonds, cash and insurance policies, it confirmed that our official valuables, contracts and financial instruments could survive nuclear war. The test must have seemed like a good idea at the time, a masterpiece of steel-and- concrete realpolitik. It's just a little shack for assembling and disassembling the devices. Only it's got dirt heaped up the sides and gravel on the roof. If something bad happens to you inside, the readings get to the folks outside, and they blow the roof and bring everything down to smother it all so it can't go critical. Only then, you're not going home for dinner. That tank over there provides extra carbon dioxide to the plants in the area. The platforms allow the effects to be seen without disturbing the plants. It's just one of the non-nuclear experiments now on the site. At 12:01 a.m. October 2, 1992, George Bush entered a moratorium on nuclear weapons testing. Just a few hours later, IceCap would have been lowered into the shaft. The tower and all of the instrument cabling are still in place, although I wouldn't trust the impedance on those cables after they've been lying in the sun all this time. The test would have determined how well a device would have performed in atmospheric conditions at 40 degrees. The debris plume was five miles wide. We found that the cars that were pointed head-on at the blast did quite well. Those that were side-on just rolled. While the Russians were here, I managed to spend about eight hours a week at home. The fact that there are two Soviet teams in and around Nevada reflects the opposing views of how to best reach that goal. The official Soviet team at the Nevada test site is experimenting with so-called hydrodynamic methods of verifying the yield of nuclear weapons, a technique favored by the Reagan Administration. Hydrodynamics deals with the motion of liquids - the rock around the shaft becomes molten when the nuclear device goes off. 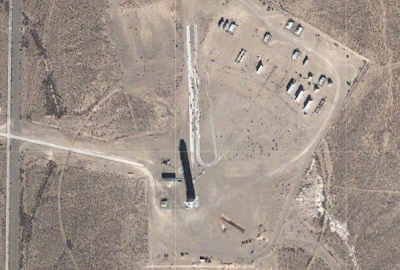 The second team, which is not part of the official experiment, is positioned at a Soviet-designed seismographic station on the California-Nevada border. It hopes to help demonstrate that the yields of most nuclear explosions can be accurately estimated with remote instruments, the method favored by Soviet officials. I didn't know about those atomic cannons. Seriously? Holy crap.